The gay socialist writer Edward Carpenter had an extraordinary impact on the cultural and political landscape of the late nineteenth and early twentieth centuries. A mystic advocate of, among other causes, free love, recycling, nudism, women’s suffrage and prison reform, his work anticipated the sexual revolution of the 1960s. Sheila Rowbotham’s highly acclaimed biography situates Carpenter’s life and thought in relation to the social, aesthetic and intellectual movements of his day, and explores his friendships with figures such as Walt Whitman, E.M. Forster, Isadora Duncan and Emma Goldman. 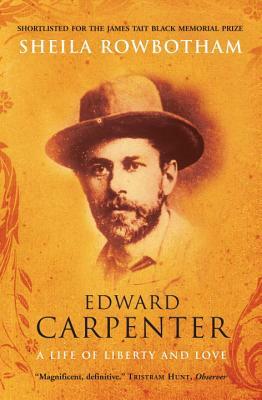 Edward Carpenter is a compelling portrait of a man described by contemporaries as a ‘weather-vane’ for his times. Sheila Rowbotham is Honorary Research Fellow in Sociology in the School of Social Sciences within the Faculty of Humanities at Manchester University and Visiting Fellow in the School of Sociology, Politics and International Studies at the University of Bristol. She is also a Fellow of the Royal Society of Arts. Her many books include the James Tait Black–shortlisted Edward Carpenter: A Life of Liberty and Love, A Century of Women: The History of Women in Britain and the United States in the Twentieth Century, Promise Of A Dream: Remembering the Sixties, and Dreamers of a New Day: Women Who Invented the Twentieth Century. She has written for, among other newspapers, the Guardian, The Times, The Independent, New Statesman, and The New York Times. She lives in Manchester.